Jute bags – a free give away! The larger bags (right and bottom of the photo) are 47 cm wide, and 32 cm high (excluding the handles) and open out to a depth of 18 cm, so they are very roomy. 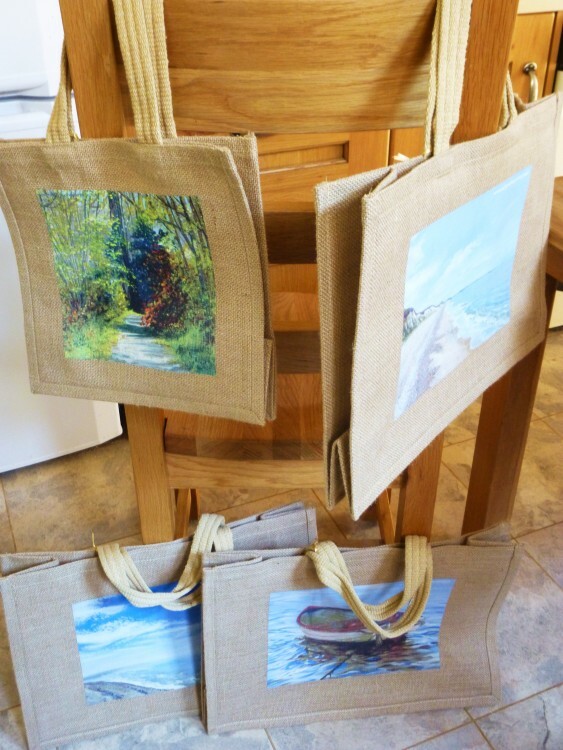 They have nice soft woven handles, and an image of one of my paintings printed on one side. They are of course useful for shopping, but would also make great beach bags, or be a useful and inexpensive present. SO – what I want to know IS, which images would be best to have printed onto them??? This is where you come in! It can be any ‘landscape’ orientated painting (wider than it is high) from any of the Gallery pages. Chose which image you would like to see, and leave me a comment with the name of the painting you have chosen. On Sunday, 30th August at 4.00pm BST I will randomly choose a comment, have the winner’s chosen design made up, email them for their postal address – and one lucky reader will get their bag in the post. To leave a comment, click on the BLUE title ‘Jute Bags – free give away’ in the box on the right hand side of your screen. A comments box will open up at the bottom of this post. Before the Harvest is beautiful and very much in keeping with the forth coming season. Would be a lovely painting printed on a jute bag for shopping for all the autumn fruit and veg to make warming country soup as the nights draw in.